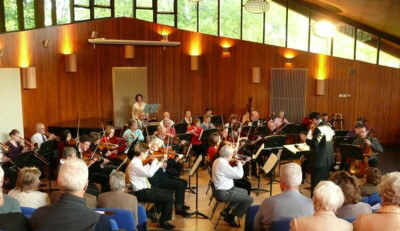 The orchestra has a membership of around 50 players of all ages. It meets beween 7.30 and 9.30 on Tuesday evenings in the hall of Firrhill High School, 9 Oxgangs Road North, Edinburgh, EH14 1DP. This year’s term dates are listed here. We perform two concerts each year, normally in December and May. The orchestra is a member of Making Music which represents and supports amateur and semi-professional music groups of all genres throughout the UK. It provides a comprehensive range of artistic and administrative services and development and training opportunities. Making Music also lobbies on behalf of its members to national and local government and other agencies.